The bark of a tree is responsible for protecting the delicate nutrition system inside the tree. The smaller the tree, the more likely it is to suffer irreparable damage due to nutritional loss. Animals that find tree bark to be a tasty treat, can cause great harm due to their gnawing and bark stripping. Leaving a tree with the difficult task of healing itself in order to survive. You can attempt to expedite the healing process, and help to save the tree from irreversible damage, if you work quickly. 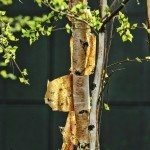 By gathering the bark, and reattaching it to the tree, you can help it to rebuild its protection and extend its life. if the animal has consumed the bark and none is to be found is to perform a clean cut around the damaged area. With a sharp knife, cut a circular shape around the area of the missing bark. Be sure not to cut any deeper than the thickness of the remaining bark. The tree will begin to mend itself at this point.